Great dealing with James to buy a car. He comes across as trustworthy and honest and offers the best price upfront. He made the whole car buying experience pleasant, when it's usually very frustrating. Vin made my whole car buying experience awesome. I had originally visited the dealership to test drive another vehicle which I passed on but Vin took the time to listen to what I was looking for and managed to find me the perfect vehicle. The deal went off without a hitch and everyone I met at the dealership was great. I'll be sending all my friends to see Vin and the rest of the folks at Meyers Orleans Nissan. Purchased mid December a Rogue from Yves Julien who thoroughly knows his product, excellent experience. Two weeks after receiving my vehicle I was coming back from Montreal, I was splashed by oncoming trucks which severely chipped my hood. I went to Myers and met with Trevor in the service department to see what they could do and after a few days they offered to have my hood repainted at no charge. They also provided a loaner during the duration. Although I was responsible for the damage Myers went above my expectations in repairing the damage. I highly recommend this dealership when I bought my used car from Myers Nissan. Vin Lakshman is an awesome salesman and a honest person to talk to when getting a new or used car. Glad that I went to this dealership and got a used car less than a week with a great deal of a used Nissan Altima car. I had a flat tire on a Friday night and the service advisor promptly offered help to get my spare on so I could make it home. And this was after official closing time. Went back next morning, got a new rim put on (it got dented when I hit that pothole on Jeanne-d'arc). Ivan Pinto was amazing from start to finish. We had been to several dealerships before choosing Myers Nissan and Ivan was a major reason why we did. Ivan was personable and made the car buying experience stress free as it can be. He actually works for you to make sure that you get the best deal possible. All the staff there is super friendly and not pushy which is refreshing. Definitely recommend this dealership and make sure to ask for Ivan. I recently bought a Nissan 370z roadster from this location and the service was superb. I want to thank Vin, Mike and the rest of the crew that made this possible. You have my utmost respect and I would highly recommand this dealership to everyone because truly they are the only dealership that know how to take care of their customer and treat them like family. All my experiences have been great. I love Tina and Vin. Both are extremely helpful and always in a good mood. Bought a used Xterra here a few years ago, it did have some issues which weren’t disclosed to me that I felt should have been. HOWEVER, the GM did take care of what they could and they have offered excellent service at the service department since day 1. Overall good experience at this dealership and I would not hesitate to take my car here for service or to purchase new! Picked up my new 2019 Kicks a few days ago. My sales person Nataly Vu was very knowledgeable and easy to deal with. Nataly made this car buying experience an enjoyable one. 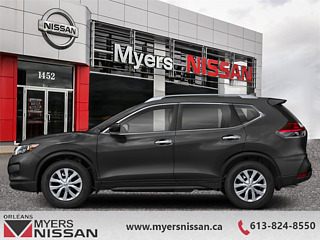 I recently purchased a 2018 Nissan Rogue and I was compelled to thank Myers Orleans NISSAN for their exceptional service. This was my first time purchasing a brand new car, and I was set on 2018 Nissan Rogue. Ehren Winges was my sales representative. Ehren provided 10/10 sale service without any pressure sales tactics from the minute I walked in the dealership until the moment I picked up my new wheels. I highly recommend this dealership and I will definitely purchase any future vehicles from this dealership. Once again, thank you for an exceptional experience! Vin was really chill to deal with. We shared a few personal stories which helped make for a very relaxed experience. He and the rest of the people I spoke with were very understanding about the vehicle being properly safetied unlike my other experiences with a few other dealerships in my time. The vehicle was impeccably cleaned and gassed up to the top when I was ready to pick it up. It was also prepared well ahead of my expectations. Thanks so much to Vin, Matt, and Mike! Great buying experience. Vin went through all the options with us and didn’t pressure a specific route. They ended up bumping us up a model for free because they had the colour we wanted on the lot. A very simple and beneficial transaction conducted over phone and emails - Mississauga to Ottawa. Very pleased. I recently visited Myers Orleans in search of a used car. I met Nataly Vu Le in Sales and was delighted by my experience. She was very informative, spent a lot of time with me and followed up continuously in order to ensure I made the best decision in regards to buying a car. Very impressed by the level of service she provided in a cheerful way. Best car dealership I've ever dealt with. End of story. They want excel in every aspect of their operations and it shows. Zero pressure sale tactics (or upsell for that matter). Dates promised are respected, and everything is always ready every time you show up for something. Don't waste time going anywhere else. I generally find buying a car stressful and frustrating, but my sales experience was very smooth and pleasant. Both my sales guy Vin and the Sales Manager who also helped me were knowledgeable and very accommodating. Happy to have my Nissan Leaf! Thanks! My experience was great! All the staff was very friendly & attentive. I would definitely recommend Myers Orleans Nissan to anyone looking to buy a car. They will do their best to make sure you have a positive experience and go the extra mile to make sure you're happy. Great group. Bought my car at Orleans Nissan and great quality service by Nissan Orleans! James was very friendly and took the time to provide an excellent customer service! We recently purchased a car at this dealership. Our sales representative, Ivan Pinto, was absolutely amazing. He was very attentive to our needs. Great customer service. We were able to try the car with our baby and Ivan made sure that our visit was simple, fast and welcoming with our baby. We are very happy with our purchase and great price! We will definitely be recommending Ivan Pinto to our friends and family. Thanks again Ivan! I recently bought a slightly used Versa at Myers Nissan Orleans. I am very happy with the car and with the customer service provided by Ivan Pinto. I was impressed by Myers large inventory. Mr. Pinto listened carefully to my wishes and found me the perfect car at the perfect price. I will be recommending Myers and Ivan to my friends and family. Overall, a great automotive purchase experience. The customer comes first. I called in advance to view a specific car. When I arrived, the vehicle was ready for a test-drive. After a few minutes, off I went on a 45 minute drive. By the time I was back, my trade-in was evaluated. We sat and crunched some numbers. The young Salesperson, John, and experienced Sales Manager, Andrew, worked hard to make a deal that satisfied my needs. Pick-up went smoothly, and it was evident the entire team wanted to make my experience an efficient one. Was I satisfied, yes. Will I shop here again, yes. Do I recommend Myers Nissan, yes. Good luck on your next auto purchase. Loved the customer service, I didn't feel pressured in anyway. My sales person, Vin Lakshman, was so helpful and patient in making sure I had the right vehicle for my comfort and needs. I would definitely recommend Meyers Nissan Orleans to anyone looking to purchase a vehicle. Every single person in that dealership is knowledgeable and friendly. Very rare to get the two in that industry. Special shout out to Tina and Patrick. Thanks for your empathy, folks. I had the pleasure of dealing with Ivan Pinto. I have yet to have such a smooth and professional sales experience. Thanks Ivan! Keep up the great work! I purchased my 2017 Murano from Myers Orleans Nissan and the service from beginning to end was phenomenal. Colin, my sales consultant was exceptionally patient and never once pressured me. I've been around the block quite a few times when it comes to auto purchases and these guys/gals are the best. Highly recommend! I was not impressed with the sales staff but the service department is very good. Having the option to book my appointments online is also a big plus. The waiting room isn't anything special but it does the trick. I've had the opportunity to visit a lot of service department in Ottawa and this is one of the best. Heated Seats, Rear View Camera, Blind Spot Detection, Automatic Emergency Braking, Android Auto! 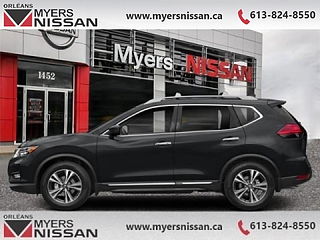 With all the modern technology you expect of new cars wrapped in a sleek and stylish exterior, this Nissan Rogue is the perfect crossover for the modern buyer. With great prices but even greater value, the Nissan Rogue was built to be the new car for the modern buyer. Big on passenger room, cargo space, and awesome technology, the Nissan Rogue is ready for the next generation of car owners. If you demand more from your vehicle, the Nissan Rogue is ready to satisfy with safety, assistance, and pure quality. This magnetic black SUV has an automatic transmission and is powered by a 170HP 2.5L 4 Cylinder Engine. Our Rogue's trim level is AWD SV. This all wheel drive Rogue SV comes with some amazing safety and driver assistance programs like intelligent trace control that applies braking to turning side for added control, active ride control adjusts suspension damping for different applications, and intelligent engine braking that uses the motor to reduce brake wear, forward collision warning with automatic emergency braking and pedestrian detection, lane departure warning with emergency intervention, intelligent adaptive cruise control, and blind spot warning with rear cross traffic alert. This SUV is also equipped with loads of style and comfort with aluminum wheels, LED daytime running lights and taillights, auto on/off headlights, fog lights, heated power side mirrors with turn signals, UV reducing solar glass, remote start, sport mode with manual shifter, Advanced Drive-Assist instrument display cluster, hands free texting assistant, rear view camera, remote keyless entry, steering wheel mounted audio and cruise controls, mood lighting, heated front seats, and power drivers seat while a 7 inch display with NissanConnect, Apple CarPlay and Android Auto, SiriusXM, Bluetooth calling and streaming, MP3/WMA/CD playback, aux and and USB inputs keeps you connected and entertained. This vehicle has been upgraded with the following features: Heated Seats, Rear View Camera, Blind Spot Detection, Automatic Emergency Braking, Android Auto, Apple Carplay, Lane Departure Intervention. To view and download a brochure open this url https://www.nissan.ca/content/dam/nissan/ca/request-brochure/en/2019/pdf/2019-nissan-rogue-en.pdf. 0% financing for 36 months. 3.9% financing for 84 months. 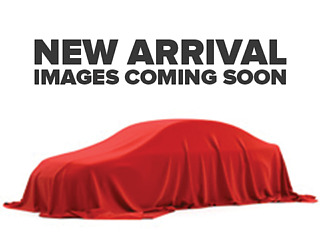 Buy this vehicle now for the lowest bi-weekly payment of $232.00 with $0 down for 84 months @ 3.90% APR O.A.C. ( Plus applicable taxes - and licensing fees ). Incentives expire 2019-04-30. See dealer for details. 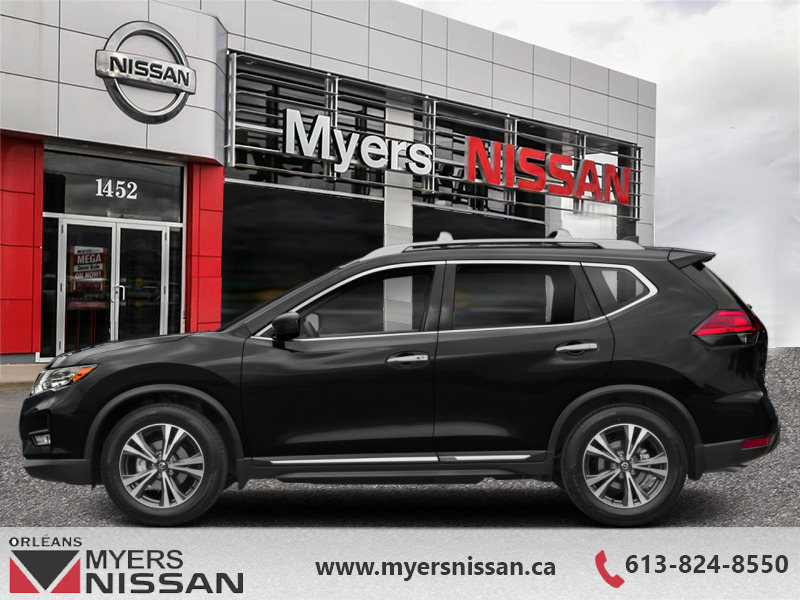 Find out why Myers Orleans Nissan is Ottawa's number one rated Nissan dealership for customer satisfaction! We take pride in offering our clients exceptional bilingual customer service throughout our sales, service and parts departments. Located just off highway 174 at the Jean DÀrc exit, in the Orleans Auto Mall, we have a huge selection of New vehicles and our professional team will help you find the Nissan that fits both your lifestyle and budget. And if we don't have it here, we will find it or you! Visit or call us today.